The other day YYZ and I were talking on the phone. I mentioned that I didn’t really have anything to post because I was just wearing versions of outfits every single one of you have seen many times. I had nothing new I told her. I haven’t really been shopping since January. Then, I remembered. Yes, I remembered. About a month ago, J went to the US to shoot more of his film – Driven. That meant I had a lot of time on my own. And, you know what that means. Yes. It means I went shopping and yes in fact I did buy something. I just conveniently forgot. 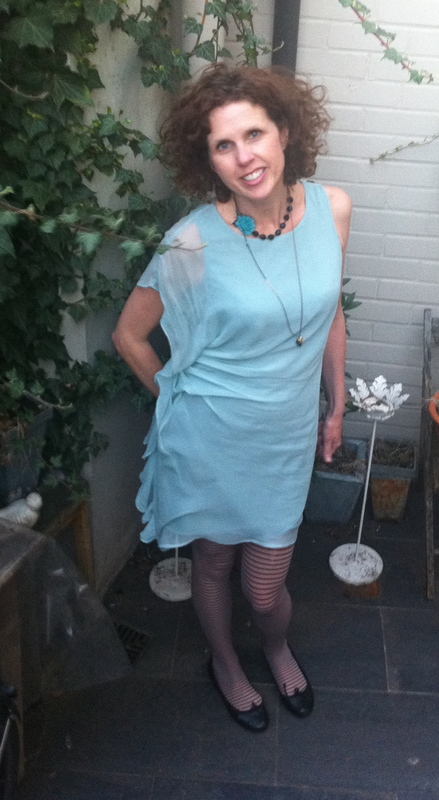 On Saturday night, as I dressed for my friend Teresa’s birthday party. I remembered, I had gone shopping. It wasn’t anything major, but is a bit fun and a bit silly. And, for those of you who like cats, perhaps this big cat will win you over (or not). YYZ and I bought the same shoes from Le Chateau. Brooch – zipper flower. I got this from J’s Mum but I believe YYZ makes these herself. Then today when I was trying to figure out what to wear that could span a 18 degree day. Yes, we started the day at 6C and hit 24C by late afternoon in the sun. So, I needed something which would keep me warm enough on my way to work, but could be stripped away as London and our offices heated up. I searched my cupboard and saw the reminder of that weekend a month ago when the cat was away. Yes, it’s true I have been shopping. 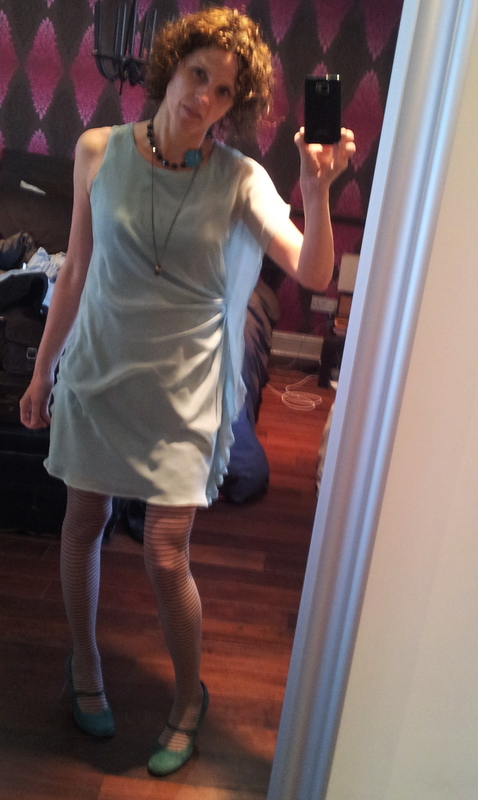 Mint Green Dress: Traffic People. Yup, another purchase I forgot I made. Talk about a whim purchase. Shoes: bought with YYZ years ago. Finally, I remembered one more transgression. In fact, this was a purchase that occurred under the watch of the cat. That is J and I were out on a “walk”. 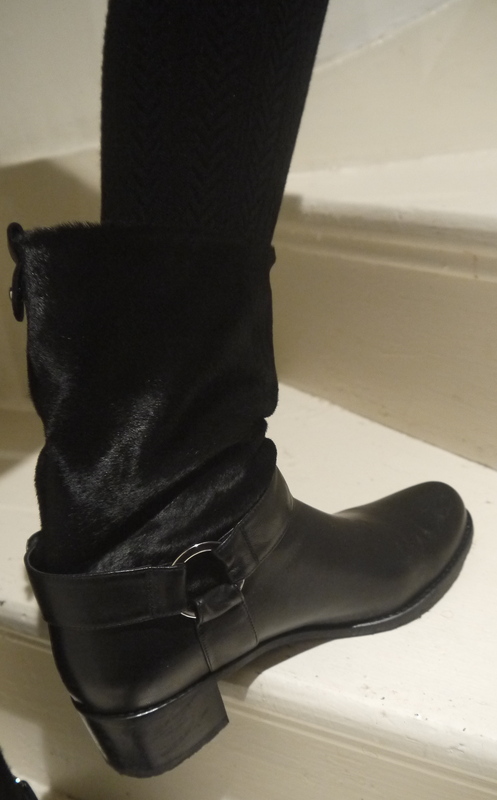 We discovered this great little shop in Broadway Market where I saw these knee high boots. We both liked that they were grey. I haven’t properly taken a photo but happened to shoot them on this day we were at the Tate Modern (see below). The top part of the new boot outfit. OK so, perhaps I have bought a few things lately. The title was meant to refer to my hexagonal-pattern fishnets, but when I think about the evolution of this outfit, I see that the song title can apply on a couple of levels. First, let me explain about the dress. I went into the mall (!) to buy soap– I only like the pump soap from Bath & Body Works b/c it is possible (if you are very, very dedicated and persistent) to get some that does not smell so chemically and fake-vanilla/lavender-y that it triggers my gag reflex. So, every now and then, I take a deep breath, gird my loins, and head into Yorkdale to snag the 7-for-$25 deal on pump soap. The problem? I must run the gauntlet…. I always think to myself, “Oh, since I’m here, I’ll just pop into Zara…” Or Club Monaco. Or Nine West…. 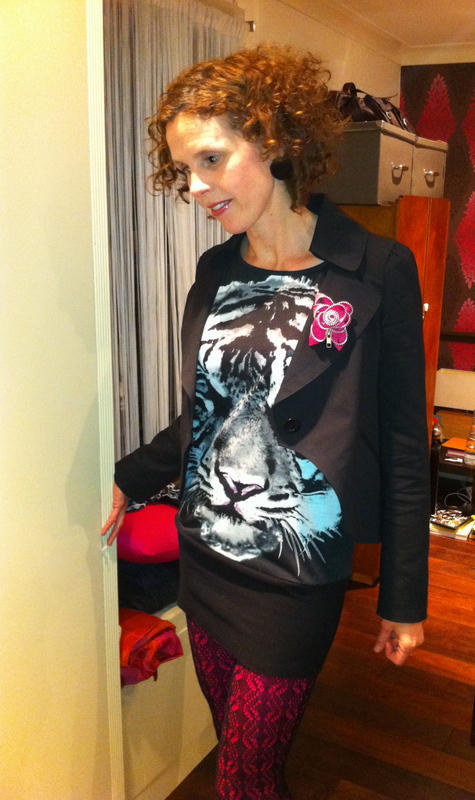 Friday, it was Zara– I was in the market for a little, shrunken blazer in a bright colour. I struck out. Well, okay, on that version of the blazer. More on that later. I thought it would be a good purchase, as I have loads of green shoes and tights and some blue shoes and tights, too. Turns out, the colours in this dress DO NOT GO with ANY of the stuff I already own! What are the chances? I mean, who else do you know who owns 7 or 8 pairs of blue and/or green shoes? Seriously– NONE of them is the right colour?! Sheesh. My bedroom floor is covered in the carnage of every pair of shoes and tights in the running, but no luck. So, what did I do? I chose to deliberately not match. 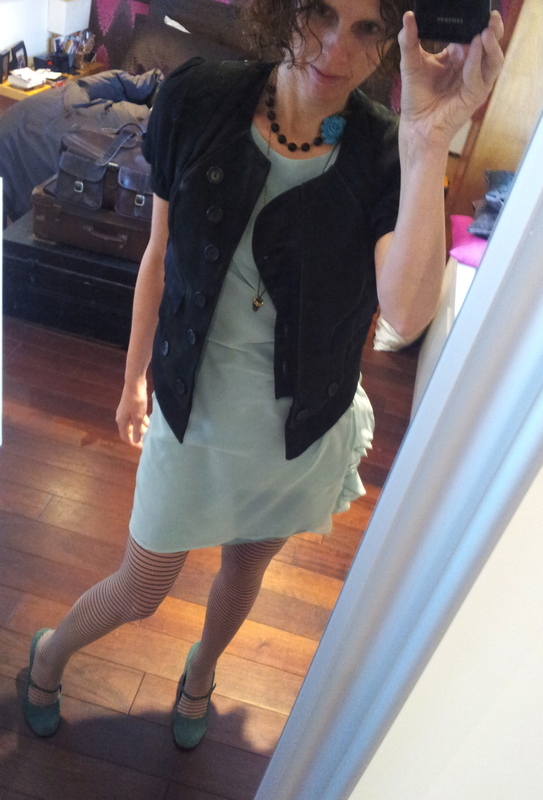 Instead, I chose tights in a similar saturation of colour, but a slightly “off” shade from the green in the dress. 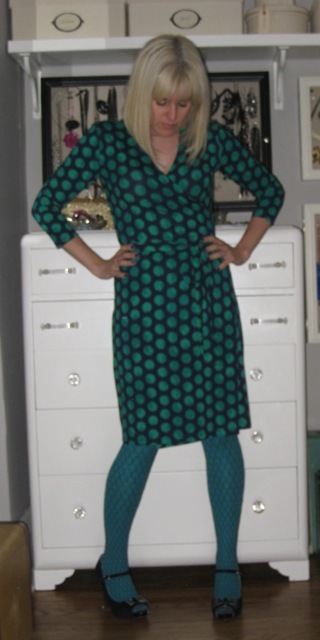 To echo the shape of the dots on the dress (I am in a polka-dot phase), I put on a pair of slate blue, hexagonal fishnets. (I think LHR has the same ones). It was a hit with the adults at work today, though I’m not sure the teenagers were down with the whole “deliberately clashing” thing. Clearly they are not Brits, right LHR? 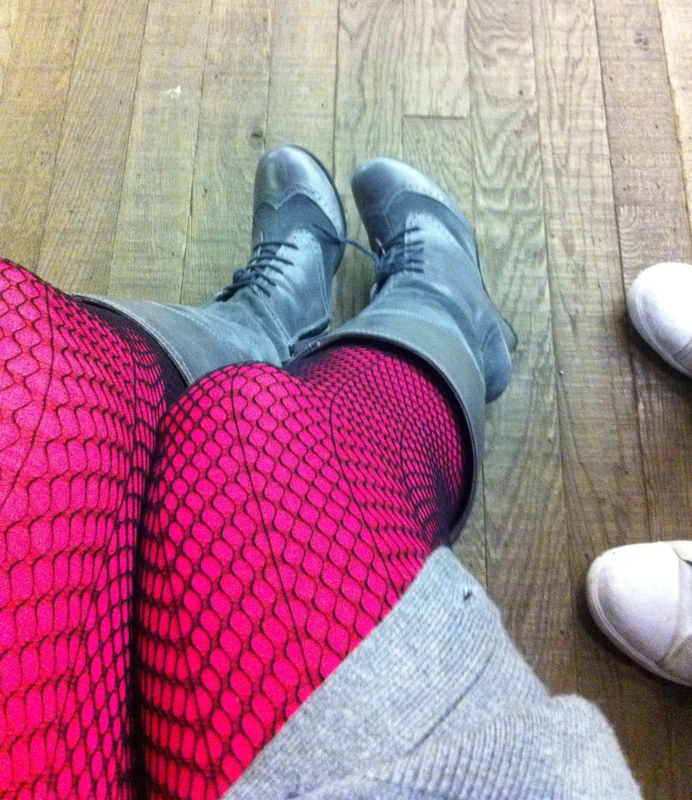 Fishnets: Designer Depot at Vaughan Mills Mall, bought with LHR about 5 or 6 years ago. LHR: That’s so January 2012. Given YYZ has posted 3 plus posts to my 1 post, I thought it was high time I got my act in gear to add something to the blog. The problem is that despite wearing clothes every day, I haven’t bothered taking any shots of what I’ve been wearing. Mostly because they are all variations on a theme. I’m not sure I’ve purchased anything new recently. shirt – black jersey shirt I bought in Quebec City about 8 years ago on a work trip with eBay. scarf – something my Mum used to wear in the 70s. Mum? Does it look familiar? Well, not exactly. 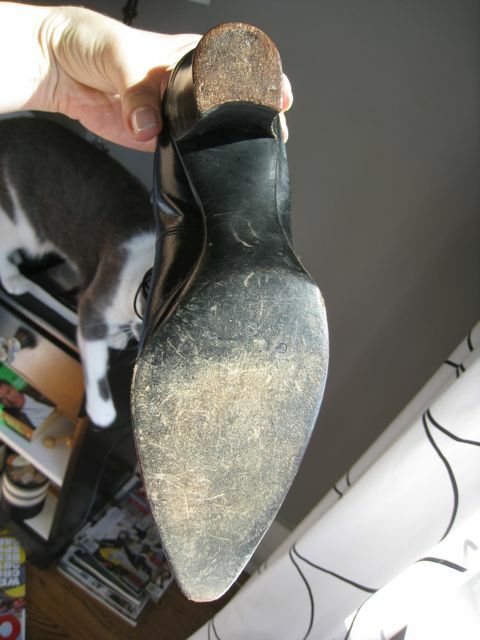 In fact, my vintage Edwardian boots were clearly owned by a lady who did very little walking– perhaps she had a driver? They are the softest, most supple leather I have ever felt. They are in near-perfect condition and, as you can see from the soles, have barely been worn. 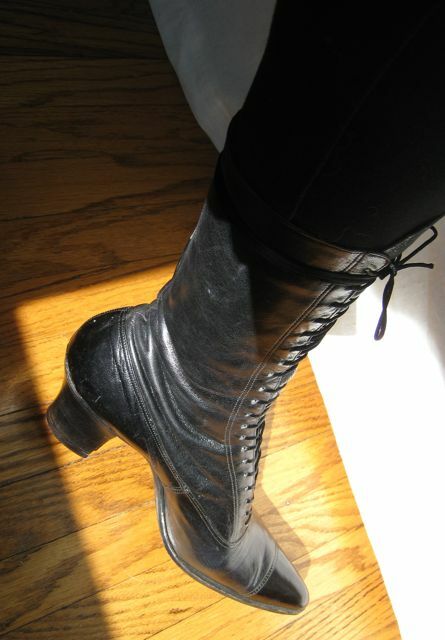 What I did not realize when I bought them is that these boots make a statement. 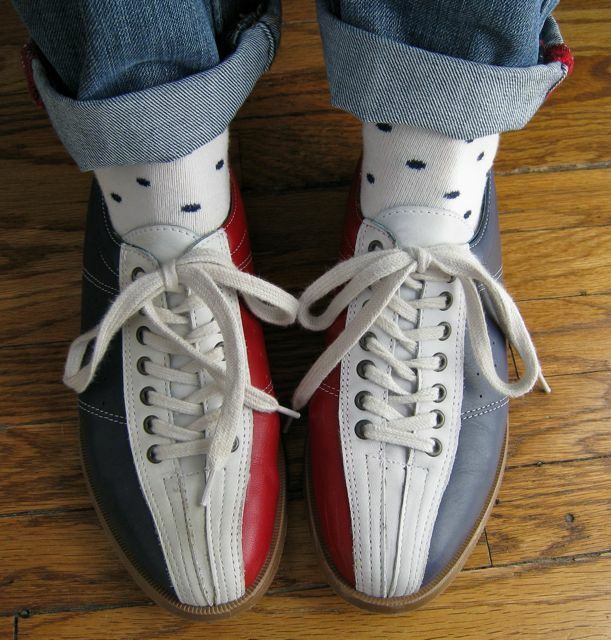 I did not realize it because they came sans functioning laces. But now I know. Seriously, it takes 20 minutes to get into these puppies. Which is probably good, as I might be tempted to wear them too often otherwise. 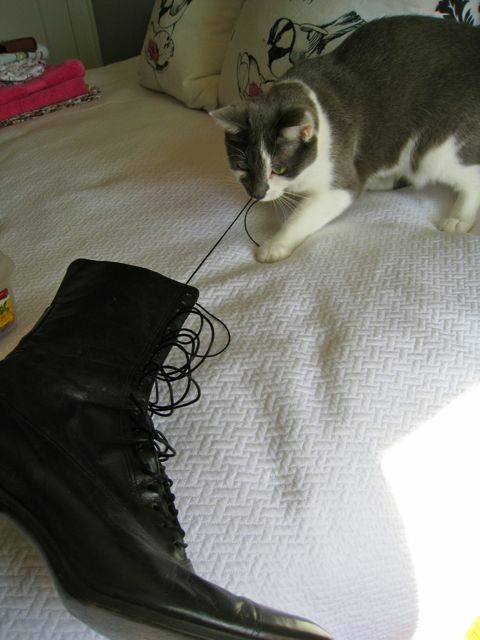 They will last longer this way; given that I do not have Anna or even the odious O’Brien to help me, I will have to really have a chunk of time to spend lacing them up– there are no hooks, only grommets, all the way up to mid-calf. I solved my lace problem by buying fine silk cord– it’s more durable than ribbon and is the perfect fit with the teensy-tiny grommets. It is, however, a bit tricky to thread through said teensy-tiny grommets, slowing down the whole lacing-up process considerably. 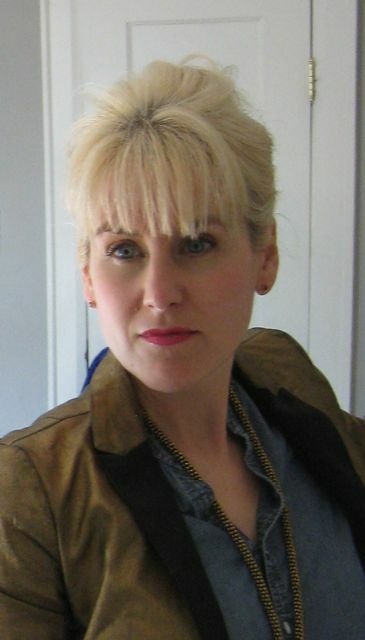 Inspired by the lovely Bri (& her dreamy, perfect hair) over at Design Lovefest, I thought I would try a new ‘do today. She is all about the messy, blonde ‘do with a bit of Brigitte-inspired volume, so I thought I’d give it a whirl. I like it! I like the way my dark roots work with the messy style. Eddie and Alex were great– they are talented and not even the antics of their lead singer could detract from that. It was fun to see Wolfgang, but more exciting to me was that his MOM was there, causing a stir when she walked back to the lighting booth to watch the show. The best part of the night (other than Kool and the Gang, who were AWESOME– we felt like we were at the Apollo!) 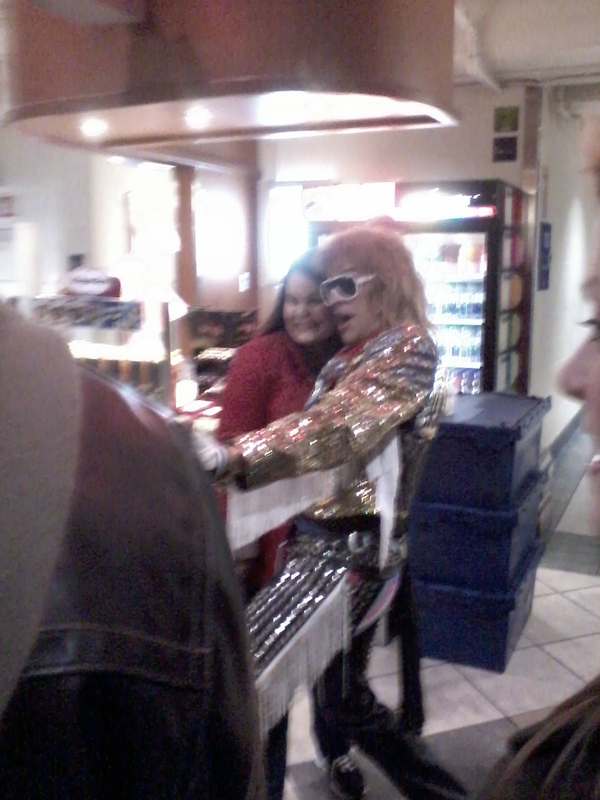 was this guy, who was very kindly posing with all the ladies on the way into the show. David Lee Roth could take some lessons in graciousness from him. Blurry cell phone photo of random girl and "David Lee Roth"
Oh, yeah– I aimed for “what the hell do you wear to a Van Halen concert?” and went with waxed jeans, a silk top and a blazer, lowish heels (walking from the parking garage and the [unrealized] possibility of dancing all night). 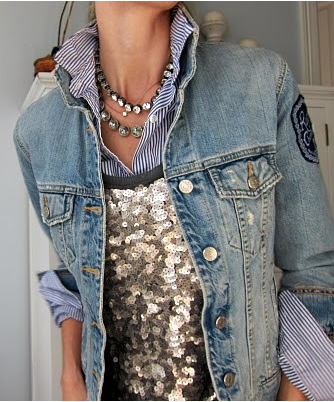 Turns out the answer to the question of what to wear to a Van Halen concert is a mullet (the stringier, the better) and a Canadian tuxedo, so I blew it. Not even the cougars were dressed to impress. Meh. Sunny skies and warm weather = no coat. A trip in search of shoelaces for my “new” Edwardian boots led to the purchase of this T-shirt instead. (There were also some shoes and a pair of trousers. I see your true colours, shining through…. Thank god they have to wear uniforms to school and I never have to see how much better the dang skirt looks on someone whose age (and legs!) are better-suited to it. 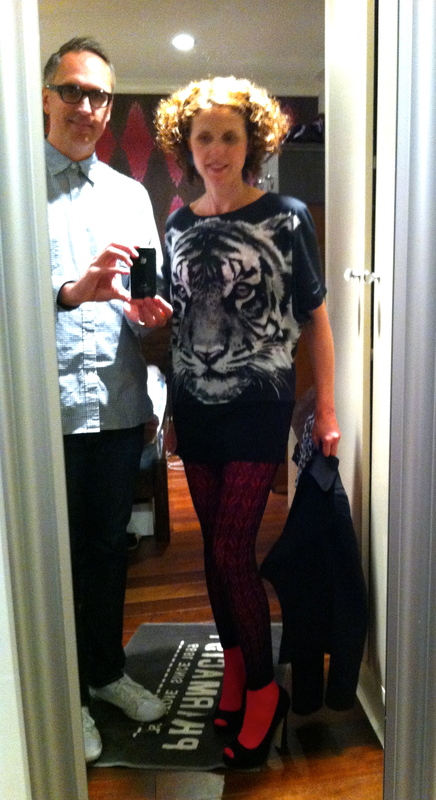 Blouse & Skirt: Zara, purchased on two different continents! In other news, have you read this yet? Similar to the Harry Potter franchise, it is a YA trilogy. Unlike this garbage, it contains nary a grammatical error, is well-written and the soap-operatic elements are rendered with a lighter hand and thus, not nausea-inducing. It is unabashedly plot-driven; unlike the aforementioned dreck, it doesn’t pretend to be about character development. Instead, it is a literary juggernaut. Oh, also, it is insanely violent. I defy you to put it down once you start reading!